My first day with the cupboard got off to a spanking start. Hoorah! Finally I went to bed without even getting to use the cupboard. Booooo! It took about 10 mintues from pulling the Cupboard from its box to going online. Great start. It took about 4 hours and 3 reboots to get all the software security updates installed. While I’m glad to have the live software security updates, 4 hours and 3 reboots seems a bit clumsy and dulls the shine of the new-computer experience that Sony manages to make really smooth. copy only files it, it does things you use like favourites and program settings. I adore that automatic copy everything wizard! While it’s copying stuff on Neverland I can’t use Neverland for anything. This took about 2 hours. Urgh. While Cupboard was still installing and rebooting I couldn’t use the Cupboard. This meant that both my computers were unusable for for several hours. Ouch! Part of the transfer process. Another couple of hours waiting before I can use the Cupboard. Getting rid of all the stuff that Sony has put on Windows for reasons that baffle me. For example, Sony have built a navigation toolbar, it behavies like the Apple Mac Navigation toolbar and is on this PC as well as the standard, dull-but-functional Windows task bar. After a quick investigation of the contents and functionality of the Sony toolbar I zap the bugger of my netbok – when the screensize is this small I dont want duplication functionality especially when it irritatingly appears and disappears. I also have to unpin some advertising stuff, such as the free trial of the already dated Microsoft Office 2007, from the Windows task bar. Sony Viao recommends that I burn a back-up disc, but the Cupboard doesn’t have a CD drive and they haven’t provided me with an external one. This little hiccup was not made clear at the purchase point – they should have told me that I might want to purchase a USB CD burner/player so that I can back-up my computer. I used the Windows back-up to back-up on an external USB Drive. This took yet another couple of hours while not using my new computer. It wouldn’t suprise me if most people just go straight online, without adequate safety and not backing up their stuff. it was getting late, I hadn’t started this process first thing in the morning. After a good night’s sleep, I will be ready to start exploring and finding out what the real differences are between a cheap netbook and a prestige laptop. The first thing on the Windows 7 starter development team’s things to do is Discover windows 7. It’s the last thing on my start-up thing to do. Neverland has retired. Hardware failure due to wear and tear. She will be donating her organs to my home network. Screwdrivers at the ready! Please welcome Neverland’s replacement, Cupboard. Neverland was a top of the range Sony Viao TT with fab processor, delicious styling, lightweight gorgeousness. She was yummy. 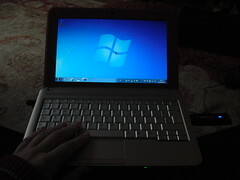 Cupboard is a cheap Windows 7 starter Netbook, smaller and heavier than neverland. Another Sony Viao, I’m a bit of a brand loyalist. Lets hope the cheaper hardware is more robust. More pushy – The key-push experience needs slightly more push, the keypad is not as sesnisitve. A subtle quality thing. More pressure is also needed on the ‘mouse’ keys. Small but chunky– despite being smaller than the Viaio TT the Viao netbook is heavier and thicker. Skinned windows XP – Windows 7 Starter looks like a visual treatment overlay on Windows XP. Yuck. That’s really ugly, like an old person dressing in clothes for a smaller teenage person. Easy file transfer is possible. So EXCITED about getting to use the CUPBOARD, what little suprises will she have IN STORE for me! Neverland is collecting symptoms of aging, the sort of symptoms that make me consider replacing a computer. 2 years old and is very well travelled. And worn. In Italy she took a bit of a beating and parts of her hinge and lid case fell off. I managed to push them back on but her lid has been a bit ‘rattly’ ever since. Tonight I accidentally trod on the power-chord connector pushing the metal protuding plug into the rubber casing. A pair of pliers have temporarily solved this problem but the power cable keeps falling out of the socket when its plugged in on my lap. Of course there is always the lure of something special and new, perhaps an ipad, a netbook, a Dell Streak, an Acer somethingorother? Canterbury has more than its fair share of people roamng the streets on a sunny summers day. I often shy away from areas that are clearly main attractions during their busy hours. I’m drawn down the empty streets and alleys. Generally empty streets are not lined with shops, museums or cathedrals. Often they do provide other pleasant suprises. 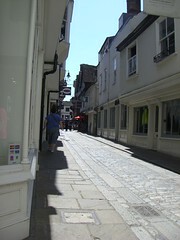 This is one of the alleyways thay pulled me from the busy streets of beautiful Canterbury. 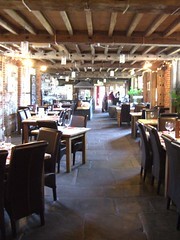 Down one such alleyway I found this fabulous rivebank restaurant, disguised as a stone shed, with few windows with flag-stone floors, old beamed ceilings, a charming French waitress, an excellent menu and no other customers. Eric, Neverland with a picture of Matrix and a Swedish speaking Florence joined me for a delectable meal. In keeping with the winter season of Norovirus bugs, flus and colds, yesterday Neverland got her first virus. Iâ€™m still not sure what exactly happened and how I fixed it, this is our story. IE7 kept opening tabs with facebook as the homepage – signed into my facebook account. Killing the IE process in the task manager didnt help – IE just fired more and more browser windows until all the processing power was used. Is that some sort of script? How did I get it? Iâ€™ve got the fancy new Windows Vista User Account Control. I washed my hands before and after handling Neverland, I even did the laundry, my life is just THAT exciting and risky. Opened the start menu and typed â€™system restoreâ€™ into the start search. Restored the system for yesterday, before the virus. Waited while the restore happened. Opened IE and removed facebook as a homepage tab. Ran a scan with my defualt (free with Neverland purchase for 30 days) virus software (MacAfee). Opened Windows defender, discovered that it is turned off by default on the machine from Sony. Tush. Turned it on and ran it – No problems showed up with the â€˜quick scanâ€™. Good to know that the fabulous system restore took me back just one day and pre-illness. If only life was that simple! I still donâ€™t know how I caught it in the first placeâ€¦. â€¦and now Iâ€™m supersticious about opening Facebook, Iâ€™m not planning on doing it until someoneâ€™s told me what probably happened and how to avoid it happening againâ€¦..
5 mins: to unpack the little beauty christened ‘Darling’ from her box of big open spaces. Easy access packing, nice work Sony! 0 mins: Read the instructions, warranties, etc. I don’t think so! I’ll leave that to Matrix (fluffball). No 6-pack of CD’s? Tinkerbell came with CD’s for Windows, AOL, System Recovery, Antivirus and 5 times the wieght in documentation! 5 mins: plug everything in, press the power button and wait to be asked all those IMPORTANT questions. Wow, so easy! 10 mins: Say ‘Yes’ to WAY TOO MANY questions that are important to someone. Not me. It’s torture I tell you! How can anyone seriously expect me to read this stuff? I am much too excited…. Stop asking me questions and show me the goodies! After much booting and geeking around Darling made the pinkier first step into the land of creative accessorizing, oh YES….